These units are designed for maximum flexibility within shipping and receiving rooms. They rest on high-capacity casters for simple repositioning anywhere in the facility. 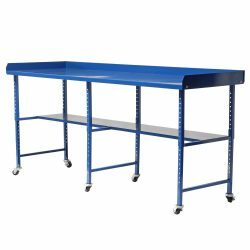 Optional threaded feet are available to locate the desk on an uneven surface. These features make the APD highly adaptable, which can provide great efficiency gains when experimenting with shipping-room configurations. Steel construction with a rugged powder-coat finish makes the APD ideal for industrial environments. The coating is formulated to resist abrasion, rust, and chemical corrosion for harsh manufacturing settings. The smooth surface provides quick, simple cleanup with standard janitorial supplies. Custom sizes, weight limits, and features are also available. Call the BHS sales team at 1.800.BHS.9500 to learn more about Adjustable Packing Desks. Heavy-duty adjustable threaded feet allows for lifting desk or leveling on uneven surface.